Kelley Whitman Bailey, 93, passed into eternity to join his Lord and Savior, Monday October 29, 2018 at Cottage Village, Childress, Texas, after a brief illness. A graveside service will be Friday, November 2, 20018 at 12:00 p.m. at the Garden of Memories Cemetery. Officiating will be First Baptist Pastor David Williams, Paducah. Visitation will be Friday November 2, 2018 from 11:00 a.m. to 11:45 a.m. at Zapata Funeral Home in Paducah. He was preceded in death by his wife of 55 years, Minnie Kirk Dobbs Bailey, his parents W.Q. and Claudia Walker Bailey, one sister Lenora Bailey Royall Truelock, one brother Chester Bailey, one nephew David Royall and a special sister-in-law, Annie Kirk Garrett. He was born January 29, 1925 in Cottle County, Texas, being a graduate of the class of 1943 from Valley View High School. After graduation Kelley remained in Cottle County to help his Dad farm until September 20, 1943 at which time he was inducted into the U.S. Navy. He served on several different ships and was involved in the Aseatic-Pacific Campaign, which was considered to have been the largest naval battle of World War II. His last ship assignment was on the cargo ship Montrose; this was his longest stay on one ship which began October 1950 through December 1953. His time o service took him to the Pacific, San Francisco, San Diego, Japan, China, and Korea just to name a few locations, with the last 6 months of his navy career being spent in Hawaii. 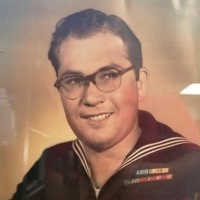 In June 1954 he was honorably discharged with the rank of Seaman First Class, at which time he returned to his hometown of Paducah, where he would remain till his death except for a few years of residency at the Cottage Village of Childress Assisted Living. During those years, he owned and operated a juke box and pinball machine business and met and married Minnie on December 12, 1958. She joined him in running this business and later they had a drapery business until their retirement in the late 1980’s. He was a loving and dedicated son to his invalid “Mom” until she became a resident of the Paducah Nursing Center, where he and Minnie would later go to live. In 1973, Kelley was ordained a deacon at the Valley View Baptist Church. After the closing of this church, he joined Paducah First Baptist in 1978 and was an active deacon until his health began to deteriorate in 2011. He is survived by one brother-in-law, Cecil Truelock and wife Judy, Childress; two nephews form the Metroplex area, Walt Royall and wife Jane, Richard Royall and one niece, Lea Galyean and Wally, Paducah, a niece-in-law Mona Royall, the Dallas area and a large extended family as well as his church family. Serving their uncle as pallbearers are Walt Royall, Richard Royall, Charles Walker, Ronald Skinner, James Dooly, Kirk Carr and their great –Uncle John Walker and Russ Walker. Many thanks go to each the Paducah Nursing Center, where Kelley resided for about three years, over four years at Cottage Village and the last several months the Hospice nurses. Donations can be made to the Paducah Cemetery Association or First Baptist Church.